The company has branded itself as the LED experts, festooning everything from gaming keyboards to speakers to coasters with LEDs that are customisable can sync with games through Razer’s Synapse 3 software. But despite Razer’s expertise in LEDs, it’s avoided perhaps the most obvious kind of LED – The ones providing the backlight for monitors. Sure Razer’s dabbled – there’s a whole range of dang fine laptops from the company that feature very attractive LED displays. But Razer’s never made a solo display before. 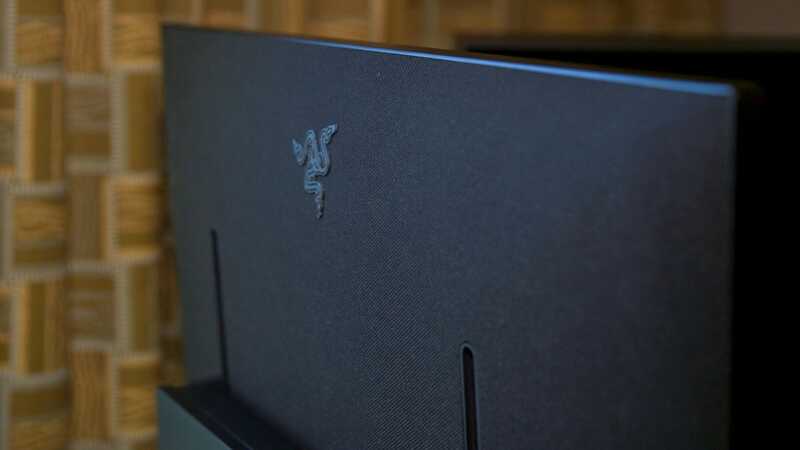 And I’ve got to admit, that while I appreciated Razer’s commitment to LEDs and chucking them on the base of the monitor, I’m scratching my head over the lack of LEDs on the back of the monitor. Lights on the back of a display typically reflect off the wall creating something called bias lighting, which can make it a little easier on the eyes when you’re staring at a bright screen in a dark room. When that bias lighting syncs with the content on the display, as first presented by Philips with it Ambilux back in 2015, it can create a trippy, but very immersive experience. It’s why HP went and announced a 65-inch monitor earlier today with LEDs on the back. Razer excluded the feature as it would have increased cost, and the company told me that many potential owners wouldn’t have the monitor near enough to a wall to take advantage of bias lighting. But it feels like missed opportunity. Still, there are some appealing elements to the Raptor. Razer claims it supports up to 95-percent of the DCI-P3 colour space, which means many more reds, greens, and yellows than your standard display. It also supports HDR, though with a peak brightness of just 420 nits it won’t wow the eyeballs like that 65-inch HP display. The 1440p display has bezels just 2.3mm thick, a claimed response time of 1ms, and a refresh rate of 144Hz. That makes this a sleek and wickedly fast display, support for AMD’s FreeSync technology, just makes things even nicer. Though it also limits the audience for Razer’s display. Nvidia still has a powerful grip of the GPU market and the decision to go with the less popular AMD might make the Raptor cheaper (FreeSync displays, on average, cost less than G-Sync ones) but could mean fewer Raptors in the wild too. A major part of the appeal of the Raptor is its glowing base – though there are plans to support VESA mounting in the future. In the interim Razer’s cleverly rethought the ports on the monitor. Instead of carefully routing your cables to a bunch of holes on the back (or the bottom) of the monitor, Razer has done the routing for your, with the Razer provided passthrough cables routed down through the base and designed to minimize bulk. But don’t worry, if you have some £100 gold-plated HDMI cable you can’t game without you can still use it with the Raptor, the look just won’t be as sleek. Input-wise, the Raptor has a single HDMI 2.0 port, one DisplayPort 1.4 port, one USB-C port (with DisplayPort 1.4 support) that also handles power delivery, and two USB-A 3.1 ports. Also, as is standard with pricier monitors, the Razer Raptor supports both picture in picture and picture by picture. The Razer Raptor will retail for $700 ( £500, exact UK pricing TBA) – a little above average for something of its ilk, but to be expected from Razer, which prioritises style over price. It will ship later this year. 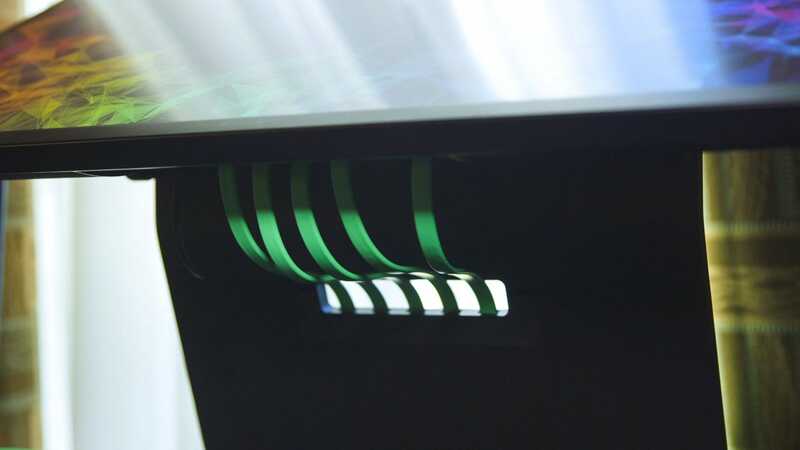 The passthrough cables connect beneath the display and wind down through the base, but disappear when the monitor is positioned properly. Yes, that’s an all fabric back. Along with the news of the Raptor Razer also announced an update to its recently redesigned Razer Blade 15. That device, which we liked a lot, will now come standard with Nvidia’s new RTX 20-series of GPUs. These are the mobile versions of Nvidia’s latest desktop processors, and it means ray-tracing is coming to the laptop. The new, faster, GPU will increase the thickness of the laptop, adding about .02-inches to the z-height, but Razer thinks that isn’t enough to dissuade buyers, and all other dimensions are the same. 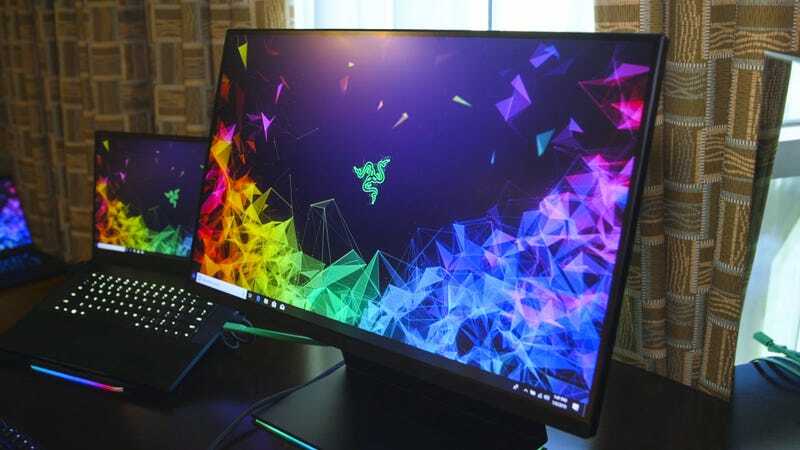 While the updated Razer Blade 15 will come with a choice of 144Hz or 4K touch, Razer is also hoping to launch a 4K OLED model later this year that was gorgeous in demos, as well as a laptop with a 240Hz refresh rate, which delivered some buttery smooth Battlefield when I checked it out. The updated Razer Blade 15 will still start at £2,300 for the RTX 2060, and then get more expensive as you move to the RTX 2070 with Max-Q Design, and the RTX 2080 with Max-Q design.